Price: 500GB is $119.99; see web site for other sizes and prices. Prices vary among online retailers. Seagate has long been a fixture in the world of internal and external hard drives. Recently, Seagate released a new type of drive—one that helps you share and save your digital media on social networks. Seagate Backup Plus External Hard Drive is what you’d expect when thinking hard drive: it comes in various storage capacities and colors, and works with both Macs and Windows. 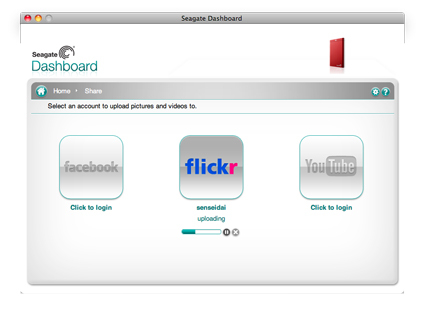 The difference is the Backup Plus’ Dashboard, which users set up to upload pictures and videos to Facebook, Flickr, and YouTube, or download pictures from Facebook and Flickr. 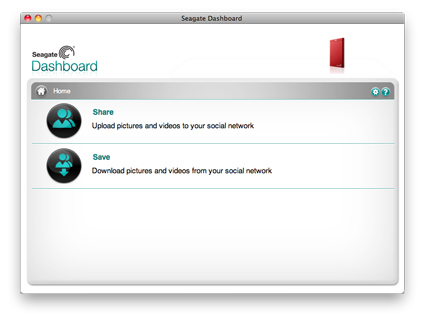 Sharing and saving is done through the Seagate Dashboard. The Dashboard can also give users information on the health of their drive and report how much space is being used. The hard drive icon shown in the upper right corner of the Dashboard is the same color as the drive, helpful when more than one Backup Plus is attached to the computer or network. Clicking the Share button opens a window with icons for Facebook, Flickr, and YouTube. Choose one, then sign in. A listing of your computer’s files and attached devices appears. Select the file(s) you want to upload, choose an existing set or album, or create a new one, then click the checkmark. Your photos or videos are on their way to their new home. A progress bar shows the media being uploaded. Once finished the Dashboard doesn’t give an option to go directly to the web site to see the media; it must be done manually by the user. Save works a little differently. You can’t choose which photos you want to download from Facebook or Flickr. It’s all or nothing. Checking the Auto Save button beneath Facebook or Flickr will cause Seagate Dashboard to periodically scan those sites and automatically download any new pictures it finds. The newly downloaded pictures are saved to a folder called My Online Documents, located in the user’s home folder. It would have been nice if the user was given the option of saving to the computer or the Backup Plus. After all, the point of an external hard drive is backing up critical data, photos being at the top of the list. Windows uses have an extra button on their Dashboard: Protect. Seagate doesn’t include it for Mac users. They feel that Mac users are better served using Time Machine for their backup plan. Keep in mind that the largest Backup Plus drive is 1TB, so plan accordingly for Time Machine. Windows users also have access to a one year free subscription of 4GB of Seagate Cloud storage. The Cloud is not available for the Mac. As a hard drive, the Seagate Backup Plus External Hard Drive is a great device. It’s ready to use out of the box, comes with USB 3.0 cable, and is backwards compatible with USB 2.0. An adapter is available for FireWire 800 or Thunderbolt connectivity. The Dashboard can help keep track of storage capacity, though it’s really nothing more than a Get Info on the computer. As for the social media side of it, the Seagate Backup Plus External Hard Drive Dashboard fails miserably for Mac users. It’s being advertised to Mac and Windows users; however, all of its features only work with Windows. Mac users are savvy: most of us know to back up our precious photos, and most of us know how to download photos we don’t already have from Facebook or Flickr. Not giving anyone a choice of what to download is also a bad decision. It’s not necessary to install the Dashboard to use the Seagate Backup Plus External Hard Drive as strictly a hard drive. Buy it for its hard drive capabilities, not the social media aspect. The two year warranty and small footprint make the Seagate Backup Plus External Hard Drive a good choice for a portable hard drive. Score would be much higher without the Dashboard. “Thank you for your recent write up of the Backup Plus. I’m writing to just clear up a few details that may have been over looked in your discussions with Eastwick about the product. I’m sorry you’re having so many problems with the Seagate Drive. I also did a search on the Seagate web site and Google, and came up empty. I redownloaded the Dashboard installer, however there’s no uninstaller with it. The Windows software has an uninstaller. I was able to drag my Seagate Dashboard to the trash, but I’m not having problems with it. I’m going to forward your question to Nathan Papadopulos, Senior Manager of Retail Corporate Communications at Seagate. Hopefully he’ll be able to solve your problem, or at least get you in touch with someone who can. In the mean time, here’s the link for Technical Support. Scroll to the bottom of the page for either Live Chat or Tech Support phone number. Good luck, and keep me posted! Sorry I couldn’t be more help. I recently got a Seagate Backup Plus Slim Partable Drive for my iMac. I installed the software and everything seemed fine. I downloaded the Dashboard, but when I open the Dashboard, there is nothing there. It’s telling me to connect a hard drive to be able to use the desktop, but my hard drive is connected and is being shown as connected on my computer. I hope this makes sense. I’m not sure if I didn’t download something correctly or what’s going on. I don’t really know what to do. Did you go into the Dashboard settings? It’s possible all features are disabled. There’s also a question mark icon that might answer some of your questions. If all else fails, here’s the link to Seagate customer support. Did you resolve this issue? I can’t see anything on the Seagate troubleshooting page about it and I’ve got exactly the same problem with my new one. I installed the Back up Plus on my Mac, but can’t get it to back up. All I have is the Seagate Dashboard with Social Media. Do not have computer or Restore on a window. I’ve tried installing it twice and that has not made a difference. I want to keep all my photos on my EHD, but something is not working right. Thanks for your help. I’m not sure what’s going on. I use my Seagate drive for Time Machine backup and haven’t had any problems. Your best bet is to contact Seagate customer support. They can walk you through troubleshooting to determine if it’s simply a setting that needs to be tweaked or if there are issues with the drive itself.